Praise be for easy, healthy and delicious dinners! They are my JAM. This post is sponsored in partnership with Hook Line and Savor. As always, all opinions expressed are my own. 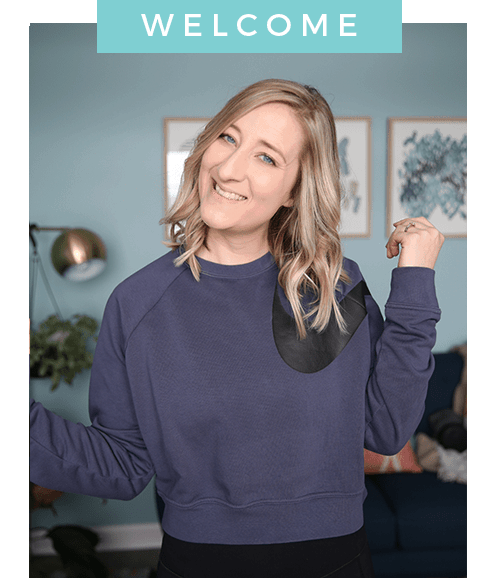 Thank you for supporting the brands that help me bring you new recipes here! In the thick of last year during our busy schedules, we were barely making healthy (and satisfying) dinners. This may come as a surprise to you because well, I’m a healthy food blogger. But honestly the nights we actually had dinner planned were few and far between. One thing that saved us was having a variety of frozen products on hand where we could center our dish around that and get creative with sides. The sides can sometimes take a little planning, but then other times you find yourself using up leftovers from other meals and creating an awesome dish. Five years ago I would have thought frozen packaged products have no place in a healthy living home. Well first of all I was so wrong (and obviously very judg-y back then but that’s another story). Second of all there are actually some great companies out there who care about the food they’re making and want to help us make better choices when it comes to what we put on the dinner table. 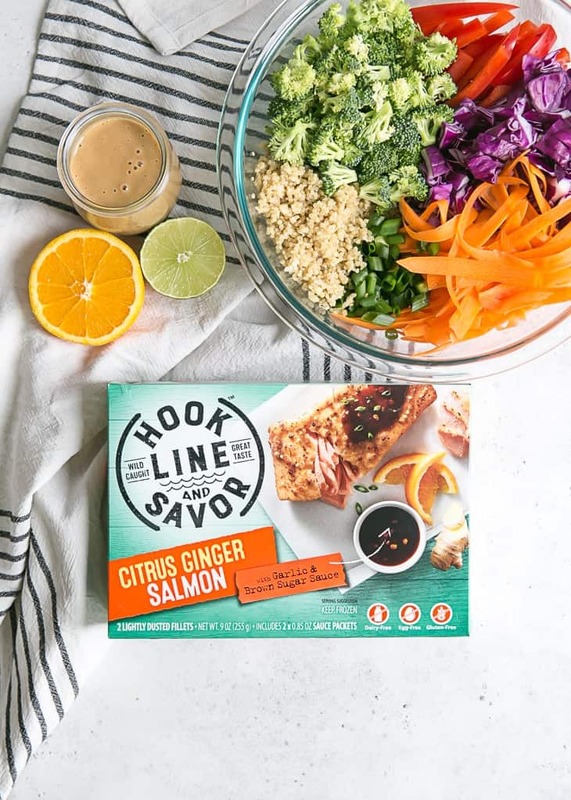 I’m excited to be partnering with Hook Line and Savor for today’s post because they are helping you make dinner quick, healthy and easy. Not to mention flavorful and delicious! Hook Line and Savor is one of those companies that truly cares about the food you feed your families. 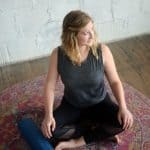 I love their brand story because it starts with a problem I’m sure many of you have too: finding meals that are healthy and safe for your family to eat. One family’s struggle turned into a passion to find better prepared seafood products that didn’t compromise on taste and quality. After enjoying their prepared seafood products for the past few weeks, it’s safe to say I am hooked <– pun intended. 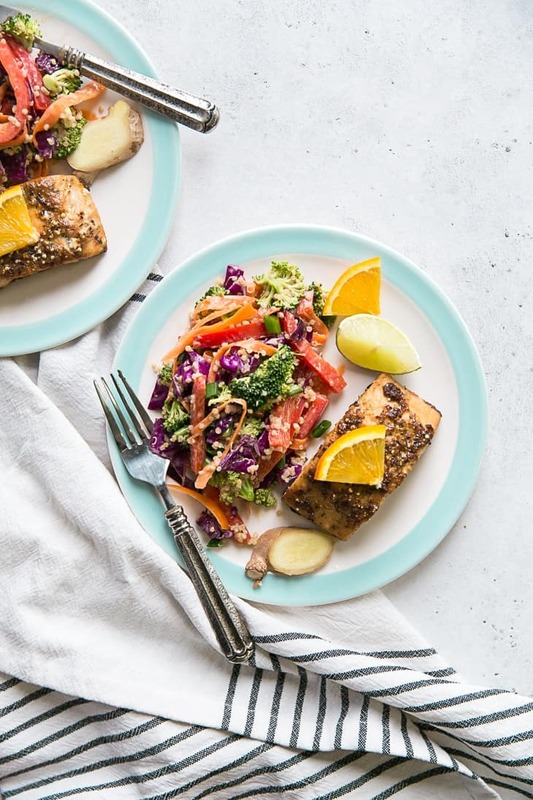 So let’s get to this easy and healthy salmon dinner, yeah?! The listed ingredients above are for a delicious and easy Asian quinoa salad recipe. You can use pre-cut vegetables or meal prep before to save some hands-on time. TIP: I like to use my Instant Pot to cook my quinoa ahead of time. It’s super quick and you can prep the veggies while the quinoa pressure cooks. 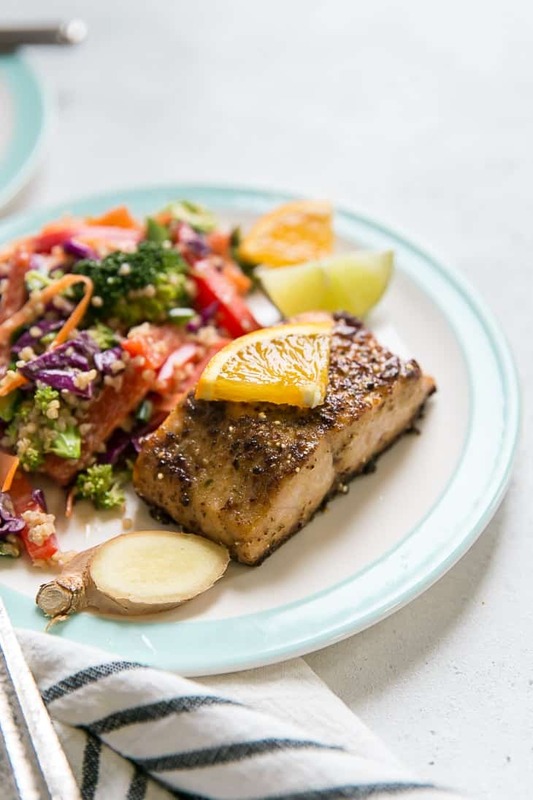 The citrus ginger salmon needs about 25 minutes to cook, which you could also use that time to prepare the salad. I’ll break it down here below. Preheat the oven to 400ºF and line baking sheet with foil. While the oven is preheating, prepare quinoa by either cooking on stovetop or use pressure cooker. Once oven has preheated, place salmon fillets skin side down on foil and bake for 26-28 minutes, until internal temperature has reached 145ºF. Place sauce packets in bowl of water to thaw. While the salmon is in the oven, chop veggies and place in bowl. Prepare your dressing by combining all ingredients in small food processor or blender – I use a NutriBullet. Once the quinoa is done, add to bowl with veggies and toss with dressing. By this time the salmon should be about done and your dinner is ready to be plated. 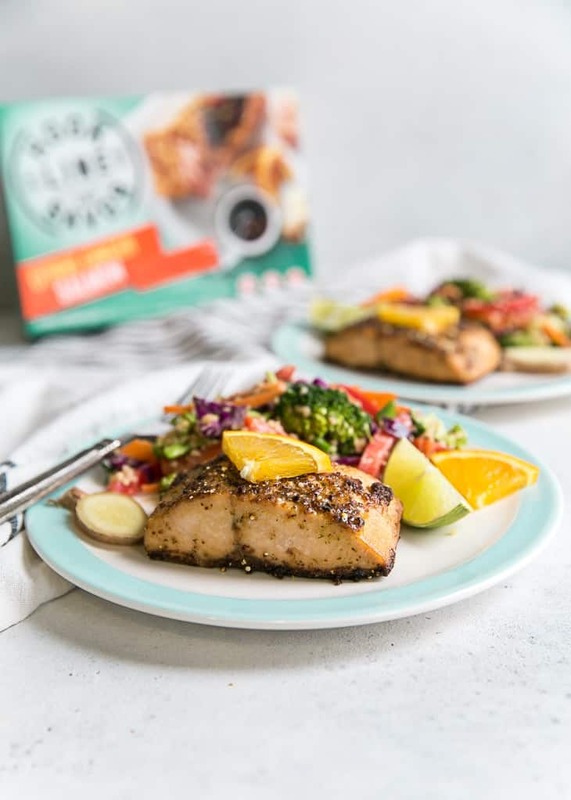 Taste-testers loved the salmon and the extra pile of rainbow veggies with the creamy asian-inspired cashew dressing was the perfect side dish. Let me know if you try this recipe by leaving a comment and review below! I love hearing from you and it helps others find the recipe too. 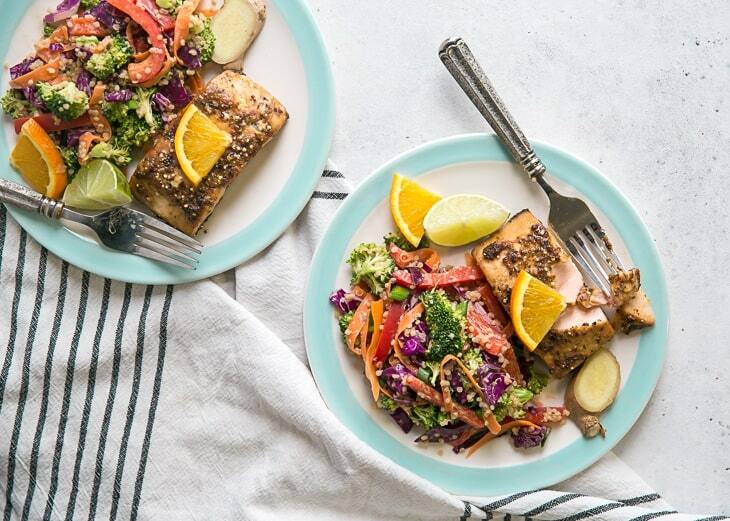 This Citrus Ginger Salmon dinner with Asian quinoa salad is the perfect weeknight dinner. 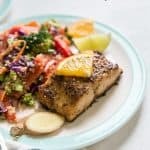 An allergy-friendly meal that is gluten-free and dairy-free, made with Hook Line and Savor prepared seafood. Prepare the salmon according to Hook Line and Savor package instructions. Prepare the Asian Quinoa Salad: prepare quinoa according to package instructions by either cooking on stovetop or use pressure cooker. Allow to cool slightly. Ratio for quinoa:water is 1:3. So 1/2 cup dry quinoa with 1 1/2 cups water if using stovetop method. Combine chopped veggies in large bowl with cooled quinoa and set aside. Make the dressing: combine all dressing ingredients in small food processor or blender, blending until smooth. Add milk or water one tablespoon at a time if too thick. Pour dressing over Asian quinoa salad, tossing to coat. 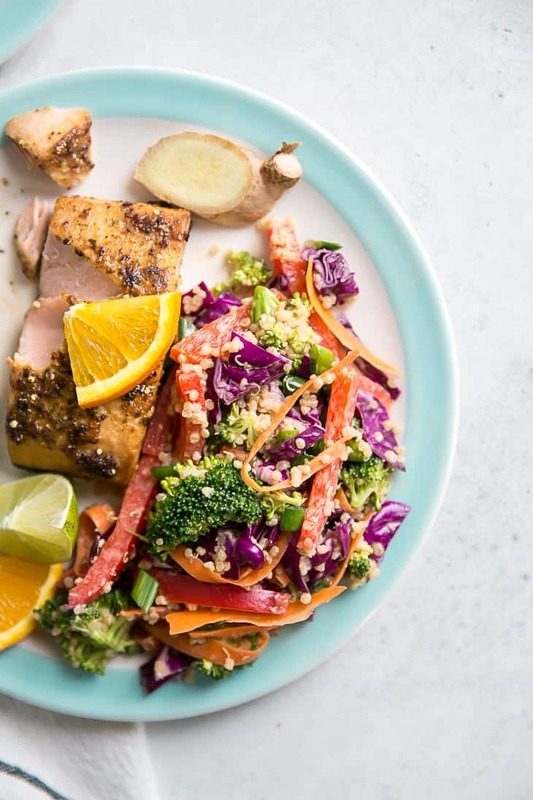 Once salmon has reached internal temperature of 145ºF, plate salmon, cover with sauce packet (or use for dipping) and serve with Asian quinoa salad. Enjoy! Store leftover Asian quinoa salad in airtight container in fridge 5-7 days. The sauce packet that comes with the salmon, what are the ingredients so I can make my own sauce?